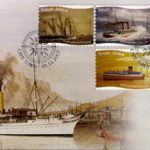 Here a small slice of maritime history which I thought to write down about St Helena the tiny remote UK Protectorate Island in the South Atlantic. Some of you will know the island, will know Jamestown the capital and the background, but there is an unbelievable modern day twist to the tale. Although a much visited and vital staging post for sailing ships voyaging via The Cape of Good Hope between Europe and the Far East, in 1815 the island of St Helena was regarded as so remote and so destitute of amenity that it was chosen as the most secure and suitable location to incarcerate Napoleon for the second time after he supposedly “escaped” from Elba. After several years in residence the troublesome celebrity died and was buried there surrounded by controversy and accusations of arsenic poisoning, but in a spirit of reconciliation with the French, his body was eventually exhumed and taken to Paris for a state burial. The Honorable East India Company who effectively governed the island and who clearly relied on it for provisioning their ships, in 1814 commissioned and built the first ship to bear the name St Helena, a 136 ton schooner designed to supply and provision the island from her home port in the UK, from Cape Town, and from various other locations on the West African coast, with a wide range of cargo and passengers, but predominantly livestock in an attempt to make the island community more self sufficient and less reliant on support from Europe. She was not a lucky ship at times surrounded by controversy, losing captains and missing the island altogether with a cargo of livestock which never reached their intended destination on at least one occasion, but was employed in this valuable service until 1830 when she was attacked by pirates. 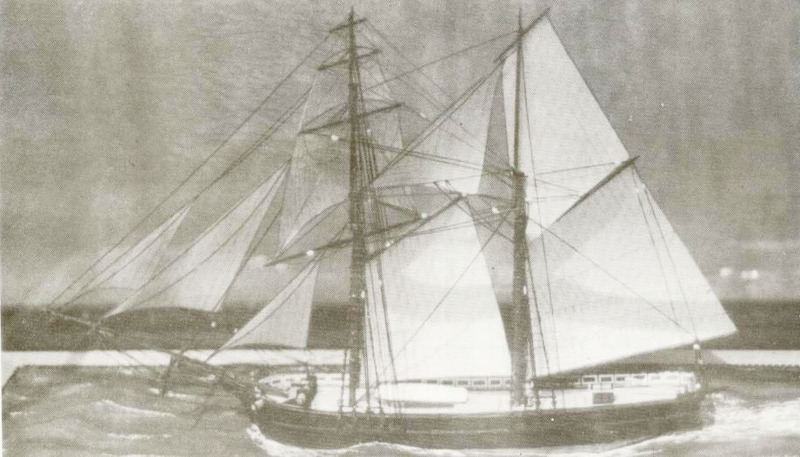 Shortly after that the Company decided to sell her on; thus ending the 16 year association with the island, she being wrecked whilst trading on the South African coast in Plettenberg Bay in 1851. Without the support of the schooner the island had to rely on support from what had become a substantial number of ships passing including the Royal Navy which fortunately took a greater share of the responsibility, bearing in mind the presence of substantial military garrisons in Jamestown as well as on Ascension Island. Such was the volume of traffic in the South Atlantic at that time that together with Greenwich, Cape Town, and Sydney, even St Helena warranted a “Time Ball” being installed and dropped from it’s staff at 1.00 pm Greenwich time every day so ships in visual contact could check their ship’s chronometers as an aid to accurate navigation. 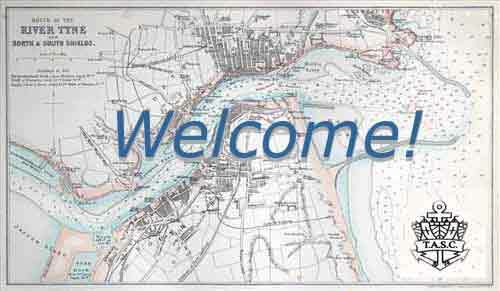 With the opening of the Suez Canal in 1863 (or thereabouts!) the island was less frequented as a staging post except for ships en route to and from the UK and her growing Dominion of South Africa, such as the Union Line which in the late Victorian era became the celebrated Union Castle Line passenger fleet, which had the benefit of a Royal Mail contract to carry the mail between the UK and South Africa. In addition however Union Castle apparently had a tradition if not an obligation to support St Helena by calling there regularly en route north and south with vital provisions and to collect and transport the island’s only industry and export in the form of bales of sisal milled on the island from the flax growing almost wild there, to be shipped to Dundee for rope making, and to make mail bags and string for the Royal Mail. An important contract and source of income for the island. This support by Union Castle and other well established large passenger liners calling there continued for almost 100 years, the islanders relying wholly on these often unscheduled visits for all their supplies; but with the general demise of the world’s passenger fleet services in the 1970s and no possible airport connection, the future of the islanders looked decidedly bleak until in 1977 the UK government stepped in to fill the gap by funding a vital lifeline in the form of a reasonable sized robust general cargo carrier suitably equipped with the necessary cargo handling gear, and with a history of providing support to remote settlements in Alaska, modified to take a limited number of passengers, and renamed RMS St Helena, the RMS denoting she was to carry the Royal Mails. The “RMS” as she was called plied between her UK home port, Las Palmas, Ascension Island, St Helena, Cape Town, and occasionally Tristan de Cunha giving vital service and support to these remote locations until the Falklands War in 1982 when much to the concern of the island populations she was commandeered by the UK military for support services in South Georgia and the Falklands war zone. A replacement was provided in the form of M V Centaur on a short term charter, designed primarily by her owners Blue Funnel as a cattle carrier with substantial passenger accommodation (which seems an unlikely combination) but this was a temporary arrangement and with the commandeered RMS retained in the service of the military after the Falklands war ended, it became clear that there was a need for a purpose designed vessel to support the three island communities. 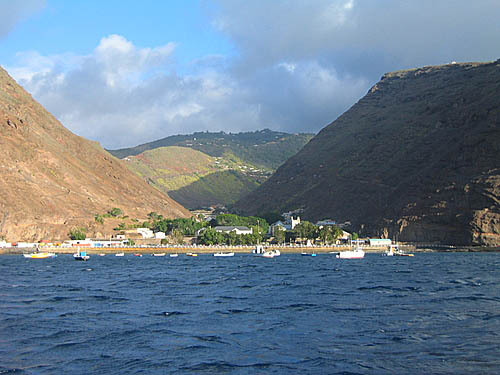 Ascension, the nearest land mass to St Helena but still over 1,000 km distant, by this time had had the benefit of a substantial military air base for 50 years or more, and many “Saints” (as residents of St Helena are called) had found employment on the base, two weeks on and two week off, being ferried back and forth between the two islands by the RMS; and they particularly and the other island communities in general were anxious that communication between their home and their work place was put on a sure footing, so their lobby for a permanent purpose designed replacement was loud and clear. For all sorts of very valid reasons, not least the volcanic mountainous terrain on St Helena and it’s remoteness from other landing strips in an emergency, an airport was then out of the question. Another unexpected blow to the economy of the island at about this time was the sudden and devastating termination of the contract to supply the Royal Mail with the only export of the island; the bales of sisal which for years had sustained a “sizable” (excuse the pun!) proportion of the workforce. A decision by the UK Civil Service and the Royal Mail to dispense with natural fiber mail bags and twine or string, unbelievably in favour of synthetic material and elastic rubber bands sealed the fate of not only the flax plantations but also the mills. Whether the civil servant decision makers in the UK responsible were even aware of the consequences of their questionable decision is uncertain, but it understandably caused a great deal of resentment. 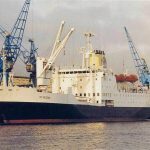 By the late 1980s agreement had been reached for the UK government to finance the construction of a purpose built supply vessel with general cargo and container capability and accommodation for in excess of 150 passengers to service the island communities, and November 1990 saw the maiden voyage of the brand new RMS St Helena, having been built by Hall Russel in Aberdeen, and the third commercial vessel to bear that name. She sailed out of her home port Cardiff, and in 1999 after nearly 10 years of her being in service I was privileged to be a passenger to Cape Town to celebrate the millennium there, calling at Las Palmas alongside, Ascension Island anchored, and also anchored in James Bay for two days spending the whole time ashore in Jamestown and being driven round the island in a 1930s wooden bodied motor char-a-banc which is still running to this day. Made so welcome by everybody, an absolutely fascinating two days on the island, as was life on board for the three week voyage, with the captain and purser (who were ex Union Castle), and crew entering into the spirit of the voyage by recreating life as it had been on board the Union Castle Liners, with Union Castle dinner menus, cocktail parties, film shows, hilarious after dinner games, and of course the traditional Crossing the Line Ceremony. During this my first visit to the island there was serious debate at that time of surmounting the difficulties and building an airport, to replace the RMS when she ended her service, but the island population and the visitors were divided in their thoughts, the younger population keen to travel backwards and forwards to their work at the military base on Ascension by air rather than take a couple of days by ship, and of course easier access to the rest of the world, and others who wished to preserve the very special status quo and limit the huge growth in tourism and the type of visitor which would result from making the island easily accessible from such tourist hot spots as Cape Town. 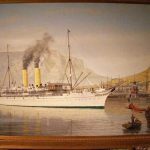 At about this time a sensible decision was taken to move the home port of the RMS from the UK to Cape Town, thus avoiding the long run up and down the North Atlantic, confined to the South Atlantic making better use of her time sailing back and forth from Cape Town to St Helena to discharge supplies and some tourists and pick up additional passengers…. the Saints who were on call for a two week stint at the military base; then on to Ascension to disembark one work force and embark those going home for a spell. Once a year I think, a call was made to Tristan de Cunha. I was so taken with the island on my first visit; when over the period 2014/2016 I was planning to spend the two winters and travel to Cape Town by sea I deliberately chose to travel on ships calling at St Helena; the Astor, two visits, on her way to and from Australia operated by Cruise & Maritime Voyages, and a third visit on Voyager owned by Voyages of Discovery. Making what was in fact my fourth visit to the island, three within the previous18 months, walking up the main street of Jamestown to my amazement I was recognised by not one but two of the local residents which really made my day as you can imagine. All three visits the main talking point was the ongoing construction of the airport and what changes were in hand on the island to support its construction and to accommodate the huge changes expected in the tourism and hospitality business. My last visit made mid April 2016 was little more that 4 to 6 weeks before the airport was due to be operational, and there was a feeling of great expectation mixed with apprehension. Although not the last ship to visit before the airport was open, my visit was supposed to be one of the last, as I gathered that by end of May this year there would be daily flights from Cape Town and Namibia, and to and from Ascension as well, and the RMS would be taken out of service. I couldn’t help but feel that huge changes were on their way and unfortunately those changes might not be for the better. For it takes a certain type of person with interests and the patience to be prepared to give up several weeks of their life on board a ship there and back in order to visit and experience the island, and a different type of visitor entirely who is only prepared to spend a few hours on a plane to make that same journey. The RMS was advertising a programme of “last” cruise visits to the island before she was to be retired and sold or scrapped after the airport was opened and operational. Here we are in August three months after the airport was supposed to be operational with planes and passengers in and out….However I have just heard all has changed, and the RMS will now continue as before servicing St Helena and Ascension Island from Cape Town for at least the next twelve months. Apparently, that because of frequent adverse weather conditions and frequent cross winds experienced at the site of the airport (which incidentally has cost the British taxpayer £250 million) and because in the event of these adverse conditions no safe landing is possible, there is no alternative airport other than Ascension which is too far distant at over 1000km, the facility does not (and it would seem cannot!) comply with International Passenger Flight Safety Regulations, and as a result so far, I believe a license to operate has been refused!!!!!!!!!! So the demise of the RMS has apparently been postponed until at least May 2017!!!!!!!!! 4) The first RMS St Helena. A lifeline for many years until she was commandeered to support the Falklands invasion. 5) The second (and final?) RMS St Helena which has been in service since 1990, and which has had a stay of execution until May 2017, with the first RMS alongside astern of her. 6) James Bay and Jamestown on a good day with the church tower just visible. To the best of my knowledge all correct but with my apologies for any inaccuracies or errors!!! The Panama Canal Expansion is the largest project at the Canal since its original construction. The project will create a new lane of traffic along the Canal through the construction of a new set of locks, doubling the waterway’s capacity. The existing locks allow the passage of vessels that can carry up to 5,000 TEUs. After the expansion the Post-Panamax vessels will be able to transit through the Canal, with up to 13,000/14,000 TEUs. The Expansion will double the Canal’s capacity, having a direct impact on economies of scale and international maritime trade. The Panama Canal expansion is based on six years of research, which included more than 100 studies on the economic feasibility, market demand, environmental impact and other technical engineering aspects. Works on the Panama Canal Expansion began on September 2007 at a total cost of US$5.2 billion. Ovation of the Seas, the last of Royal Caribbean’s three 167,800-ton, 4,180-passenger next-generation Royal Caribbean cruise ships, will launch April 2016 in China. Like Quantum and Anthem of the Seas, Ovation of the Seas will feature many first-at-sea innovations including RipCord by iFly, a skydiving simulator; North Star, a jewel-shaped glass capsule that rises 300 feet above sea level, providing 360-degree views from high above the ship; and SeaPlex, the largest indoor sports and entertainment complex at sea with attractions ranging from bumper cars, roller skating and video gaming to a circus school complete with flying trapeze classes. Currently under construction at Meyer Werft shipyard in Papenburg, Germany, Royal Caribbean has confirmed that Ovation of the Seas will be specially built with the Chinese cruise market in mind and will spend most of its time in China, with a short season sailing from Australia. 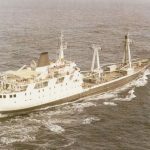 A forgotten ferry which transported passengers between North Shields and South Shields for more than 20 years has been discovered in Ireland. 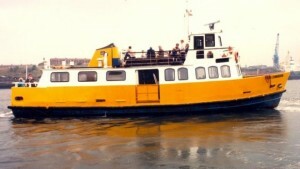 The Freda Cunningham, which worked on the River Tyne from 1972, was taken out of service in 1993 and sold. Ferry operator Nexus said its fate had remained a mystery until the new owners contacted them. 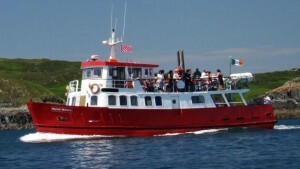 Since 2006, the vessel, now named Mystic Waters, has been operating between west Cork and Sherkin Island. Carbery Isle Ferries Ltd carried out research into the vessel’s service history and found her previous job was on the River Tyne. 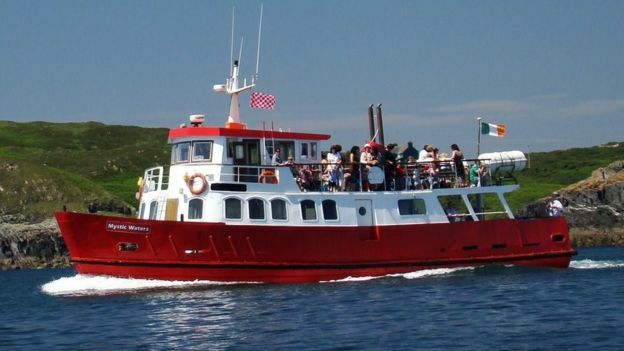 Owner of the Sherkin Ferry, Rosaleen O’Driscoll, said: “It’s always lovely to find out about the history of the boats that we operate. Nexus has operated the Shields Ferry service, which transports more than 500,000 people each year, since 1972. Shields Ferry Manager, Carol Timlin, said: “It’s really wonderful to see that the Freda Cunningham is still carrying passengers after all these years. “We had wondered for a while what had become of her. It became a bit of a mystery. The operation to tow a listing cargo ship away from the French coast has succeeded, maritime officials say. A Spanish tugboat “managed to pivot [the ship], point it towards the open sea and begin towing it,” spokesman Louis-Xavier Renaux said. The vessels are travelling westward at a speed of three knots (5kmh; 3.5mph), he added. The 22 crew members of the Panamanian-registered Modern Express were airlifted off the ship last Tuesday. Officials feared the vessel, which was about 44km (27 miles) off Arcachon near Bordeaux in south-western France, could run aground. But four maritime experts were able to attach a tow line to the vessel before being evacuated. f the operation had failed, the ship could have hit France’s south-west coast between Monday night and Tuesday morning. Bad weather hindered rescue efforts on Sunday, two days after another tow line to the 164m (538ft) vessel was broken in rough seas. The ship, which is carrying 3,600 tonnes of timber and digging machines, was listing at an angle of between 40 and 50 degrees. The Atlantic maritime prefecture said it was “totally impossible to put the cargo ship upright”. Around 300 tonnes of fuel are on board, French authorities say. The Sud-Ouest newspaper reported (in French) that emergency measures were to be put in place if the ship ran aground, in order to contain the fuel and remove it. In 2002, the Prestige oil tanker sank off the coast of northern Spain, spilling 50,000 tonnes of oil and polluting thousands of miles of coast. The Port of Tyne has announced a new commercial agreement with one of the UK’s leading importers of plywood. In an initial three year deal with Gloucestershire based International Plywood the Port of Tyne in South Shields will provide office accommodation, cargo handling, covered storage and onward UK wide road distribution for timber products imported through the Port. Multi-geared break-bulk vessels will import plywood and other timber products to the Port of Tyne from the Baltics and as far afield as South East Asia and South America. It is understood that “The Port of Tyne is unique in its ability to not only manage break-bulk of non-containerised cargo but to also handle containerised products, storage and distribution providing optimal customer service. International Plywood, supplies products to leading building merchants, housebuilders and various other UK markets.